Well, huh. Another book that I can’t give a review on because I haven’t read it. And I’ll put this one in the donate pile unread. 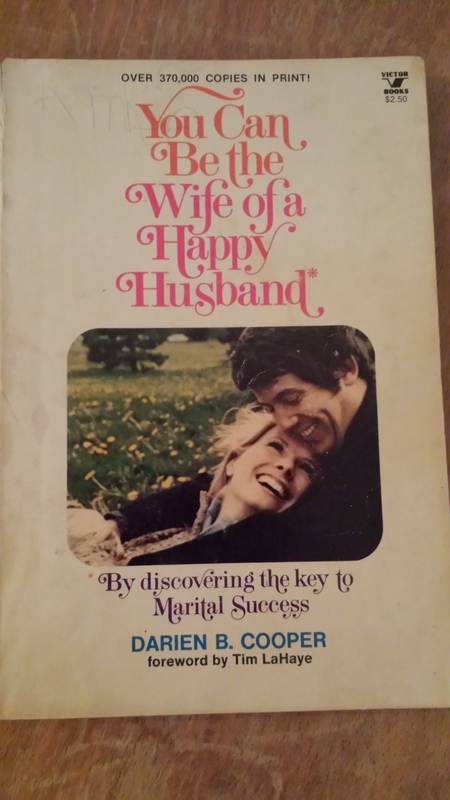 You Can Be the Wife of a Happy Husband *By discovering the key to Marital Success was written by Darien B. Cooper and published in 1974. I don’t know, Folks. I wonder if there was an all-out counter-assault on the women’s libbers back in the day. I think I’ll make it a point to have coffee with some of my friends who are part of my mother’s generation. I’d like to hear their take on the culture back in the early 70’s. And I wouldn’t recommend this book. One time, I was enthusiastically sharing some advice that I’d heard from an acquaintance with a friend of mine who is also a mentor. She listened and then said, “Oh Sharon, be careful. She isn’t healthy.” She wasn’t being judgmental or snobby. She saw something that, in my naivete, I didn’t see. Over time, I saw that other woman’s life crumble around her. And I learned to be more discerning about whose advice I listen to. I know that the author, Cooper, means well in this book. But it raises a lot of questions and red flags for me.